While Navien, Inc. was launched in North America as recently as 2006, the parent company KD Navien has been a name synonymous with condenser boilers in Korea for the past 38 years. But ever since they launched their tankless water heaters, the company has sprung a new leaf. Their models boast of some amazing and practical features that not only save money on energy bills but also ensure that you have a reliable, easy to use heating solution that lasts longer than conventional heaters. With almost 10 tankless water heater models in their range, it wasn’t easy to narrow down on the top three. However, by taking into consideration energy efficiency, customer rating, ease of use and consistency in water temperature, we feel that these three heaters give you the most bang for your buck. The NPE-210A-LP is the mid-range model from Navien’s NPE-A series where A stands for advanced. The 180A is its smaller sibling while this is succeeded by the 240A. 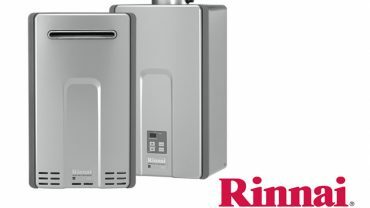 This is a condensing tankless water heater and an absolute brute of a machine that boasts of features like a 10.1 Gallon per minute maximum outflow. And it can be cascaded up to 16 units at a time. That alone makes this perfect for homes with high demand as well as for commercial setups like rentals and lodges. When the first heater reaches the 80% capacity cap, the next one automatically switches on. Further, the NPE-210A has an integrated ComfortFlow feature with an optional buffer tank and a recirculation system. When activated, hot water is stored in the buffer tank and drawn from it to reduce heating time. Also, the recirculation system uses the main supply lines to deliver hot water to any fixture in the house with the minimal wait time. Like all other Navien water heaters, the NPE-210A-LP has dual stainless steel heat exchangers which offer excellent resistance to corrosion and lasts much longer than copper condensers. Also, being a condensing heater, you can save money by installing a normal PVC or CPVC venting system. One of the best features of the NPE-210A-LP is that it is field convertible and you can switch from Natural Gas to Liquid Propane by swapping a simple cylinder that is included in the pack. This is an excellent choice for installations in remote locales off the grid. The durable metal construction means that you can install this indoor as well as outdoors easily. It is compact, looks great and has an easy to use control panel on the front with a digital display. Can’t ask for more really! Outside installation might require the expertise of a professional. But that’s hardly a deal breaker for us. The NPE180S-NG is part of Navien’s NPE series of tankless water heaters. These are the standard variety and the most notable difference from the NPE-A models is the lack of a recirculation pump and the buffer tank. In a large house, that would typically translate into a few seconds of wait time before you get hot water in the shower head. In a smaller house, however, the difference would be too small to be an annoyance. In fact, due to the lack of the SmartFlow feature, the NPE series of heaters are at least 2% more energy efficient. It has the same white metallic casing, the easy digital control panel on the front with controls that are a breeze to adjust. There are buttons to adjust the temperature from 98-140 degrees, switch between degrees and Fahrenheit for the temperature display as well as see the self-diagnostic features. Typically, if your cascading feature is not functioning well or if there other problems with the heater, it will be displayed on the LCD in the form of icons. So will the flow rate for the fixtures that are drawing water. Under the hood, it features the twin stainless steel heat exchangers, the water flow sensor that automatically mixes hot and cold water and the air pressure sensor, all of which ensure that you get hot water at a consistent temperature. The NPE180S-NG is compatible with an existing ½” gas pipe which is a standard across homes in America. This avoids the need for expensive plumbing or repairs. By the way, this can also be installed outside provided you buy the Navien Outdoor venting kit. The NPE-240-A is the top model from the NPE series. It is rated for a maximum input of 199,900 BTU/H and can be installed both indoor as well as outdoor. It features the buffer heating tank and the recirculation system that increase the efficiency and reduce waiting time for hot water. Also, using the recirculation system gives you 3 LEED (Leadership in Energy and Environmental Design) points or credits. High demand set up? No problem. This is a high capacity water heater and it won’t as much as flinch even if you have multiple fixtures drawing hot water at the same time. It features an intelligent preheating sensor that detects heating trends and automatically sets up the heater accordingly. For example, if you power the heater on every day at 10 am and set the temperature to 120 degrees, the NPE-240-A detects this as a trend and automatically activates the preheating setting a few minutes earlier. So, when you power the heater on, you have hot water in seconds. Also, the intelligent water flow mixer detects if the water temperature is heated beyond normal and mixes cold water to adjust the temperature automatically. If for some reason, you choose to operate this without the recirculation smart flow feature, you won’t even notice that the heater is running. It is whisper quiet. Even with the smart flow, there’s just an occasional whirring sound. Navien has been the market leader in condensing heat technology which has been used widely in their boilers as well as heaters. They have a range of condensing tankless water heaters which do not need an expensive venting and hence can be as efficient as 98% as compared to non-condensing tankless heaters which can have reduced efficiency. Most tankless water heaters have a single heating element that heats the water when the inflow is detected (Activated by water pressure). However, Navien has two heat exchangers. One primary heat exchanger and one secondary heat exchanger. When the water flow is detected, the secondary heat exchanger kicks in and starts to preheat the water before transferring it to the primary heat exchanger. The result? Instantly heated and consistent flow of hot water for as long as you need. There will be zero fluctuation in temperature irrespective of how long you use the water fixture. More importantly, both heat exchangers are made of stainless steel rather than copper, which is normally used. Copper is prone to corrosion and whitening whereas stainless steel lasts for years. Navien offers a 15-year warranty on their heat exchangers. Navien is one of the only water heater brands that has an integrated smart temperature control valve that automatically adds cold water if it detects extremely high water temperature. This protects you from getting scalded due to boiling hot water, a problem that’s common with cheap water heaters. So, you always get water at a stable and safe temperature. Navien water heaters feature an advanced and upgraded TDR or flame size adjustment system that automatically amplifies or reduces the heating flame from 14-100% depending on the temperature of the incoming water. This prevents unnecessary wastage of gas and heats the water only as much as what is needed. Navien’s water heaters are energy star certified for up to 0.97 UEF / 0.99 EF. That’s the best among tankless water heaters in America. So, if you are considering switching to a tankless model to save on energy bills, Navien is your best bet. Navien has a range of water heaters for residential, professional and commercial setups. In households with high demand, you can cascade some of their heaters without any external control system. This doubles the output of hot water without the need for expensive and cumbersome plumbing. We love the Navien NPE-A series which features an internal recirculation system. This system includes a buffer hot water tank and relies on the main water supply to recirculate hot water to the fixture that needs it the most urgently. This reduces the wait time for the water while the water inflowing is getting heated by the heat exchangers. Navien also has a separate Wi-Fi control module that allows you to remotely connect to your Navien water heaters and customize the settings as well as control power. This is an excellent option for households with kids and working parents. It allows parents to control the heater from just about anywhere. However, if your heater was installed prior to 3/22/2016, then you might have to purchase an additional Main PCB & Front Panel. All that talk about technical features and we almost forgot to mention the aesthetics. Navien water heaters look stunning with their white metallic casing and minimalistic control panels. They are compact sized which makes installation a cinch, even in space-constrained residential setups. In fact, we spoke to property managers and landlords who mentioned that Navien water heaters had improved the property value and prospective resale value. Navien tankless water heaters are energy efficient, easy to use and will more than just their upfront cost. They are fast, heat consistently and with a 15-year warranty, should outlast most other appliances at home. If you are looking to cut down on energy bills or even looking for a better replacement for your old worn out the water heater, look no further.